By using this website and/or registering at www.golduno.com you are authorizing GoldUno, its representatives & its partners to contact you via email or phone call or SMS and offer services for the product you have opted for, imparting product knowledge, offer promotional offers running on website & offers offered by our partner banks. Irrespective of the fact that you have registered yourself under DND or DNC service, you are still authorizing GoldUno, it's representatives & it's partners to give you a call for the above mentioned purposes till 45 days of leaving your number on our website. Also based on your active opt-in you are open to receiving promotional offers from GoldUno & our partner banks and insurance companies. Hence, there is no DNC check required for the number you have left on our website. 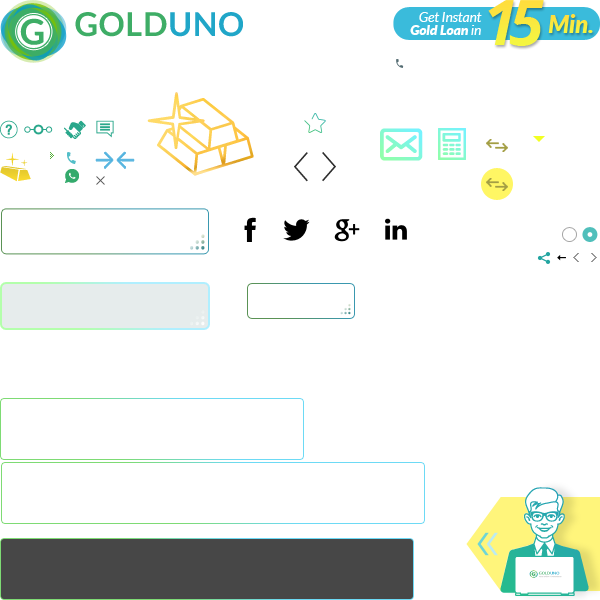 "If you are no longer interested in receiving e-mail announcements and other marketing information from us, or you want us to remove any information that we have collected about you, please e-mail your request to support@golduno.com." We collect personal and financial information from you while you use the site, and most of this collection occurs during registration. Certain areas and features of GoldUno.com are available to you without the need to provide to us any information. The information you will need to provide while applying for a loan include your name, email address, address, pincode, Pan no. , password and a username to participate in the user forum. Third parties for their marketing and promotional purposes, such as the number of users who applied for a loan. If your Registration Information provided when you applied for a product on Sites changes, you may update it whenever you apply for a new product such as a loan via the Service. To review and update your personal information to ensure it is accurate while your application is in process, contact us at support@golduno.com. You will not be able to update the information you have provided in an application after a decision has already been made on it; however you may create and submit a new application with your updated information. We will retain your information for as long as your account is active or as needed to provide you services. If you wish to cancel your account or request that we no longer use your information to provide you services contact us at support@golduno.com. We will retain and use your information as necessary to comply with our legal obligations, resolve disputes, and enforce our agreements. When you register on our site you will receive emails that confirm specific actions you requested. You will receive notifications confirming your registration, the successful verification of email addresses and confirmation of successful submissions of loan requests and portfolios. You will also receive progress updates on the status of loan requests and submitted portfolios. These are transactional notifications that you cannot opt out of receiving, as they are in place to protect the security of your account and your personal information. We may also send you responses to emails you send us, if appropriate or applicable. From time to time, we will also send user surveys, requests for user feedback regarding user experience and site operations or marketing offers from us or from us on behalf of our marketing partners. The completion of these surveys or requests for feedback or acceptance of any offer is strictly voluntary. If you do not wish to receive these offers, surveys or user feedback emails, please opt out in any offer email you receive from us. We display testimonials of satisfied customers on our site in addition to other endorsements. With your consent we may post your testimonial along with your name. If you wish to update or delete your testimonial, you can contact us at support@golduno.com. Technologies such as cookies, beacons, tags and scripts are used by GoldUno, our analytics providers such as Google Adsense, Google Analytics etc, and our marketing partners. These technologies are used in analyzing trends, administering the site, tracking users’ movements around the site and to gather demographic information about our user base as a whole. We may receive reports based on the use of these technologies by these companies on an individual as well as aggregated basis. Log Files - As is true of most websites, we gather certain information automatically and store it in log files. This information may include internet protocol (IP) addresses, browser type, internet service provider (ISP), referring/exit pages, operating system, date/time stamp, and/or clickstream data.